...... Just recover your valueable messages in a few clicks! Accurate Outlook Express Mail Expert helps you recover, repair or backup your email when necessary. It is the number one Outlook Express Mail utility for its simplicity and advanced abilities.An intuitive user interface makes AOEME a ridiculously easy to use product without compromising its ability to provide superior performance. Accurate Outlook Express Mail Expert read .dbx files and identify e-Mails stored in its. Recovered messages can be viewed and stored as the messages files in .eml format. Later saved in .eml format messages can be opened and viewed/moved/copied in Microsoft Outlook Express folders. The user can choose the specific email according to his preference; a normal extract will backup/recovery your email. AOEME doesn't change or delete any information stored in your email files. The Supported dbx file format: Microsoft Outlook Express 5/6. 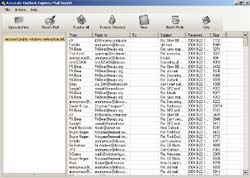 Qweas is providing links to Accurate Outlook Express Mail Expert 3.2 as a courtesy, and makes no representations regarding Accurate Outlook Express Mail Expert or any other applications or any information related thereto. Any questions, complaints or claims regarding this application Accurate Outlook Express Mail Expert 3.2 must be directed to the appropriate software vendor. You may click the publisher link of Accurate Outlook Express Mail Expert on the top of this page to get more details about the vendor.